Scratch n' Scram is an easy to apply scratch-resistant peel and stick vinyl sheet that when scratched releases a citrus scent that makes pets scram. Scratch n' Scram provides complete surface protection while training your pet. Soft Claws were developed by a veterinarian. 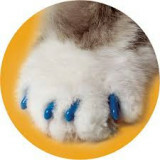 Soft Claws are vinyl nail caps that work great for problem cat scratching. Soft Claws are a great alternative to cat de-clawing. CRITTERCORD™ brand cord protectors are engineered to protect pets from dangerous electric cords, and to protect expensive household cords from pets that chew. Eliminates organic odors in minutes! Natural enzymes chemically change the source of the odor to eliminate it, not simply mask it. 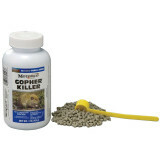 Easy-to-apply pelleted bait can kill pocket gophers in just a few hours. 1 tsp. of bait is applied underground in either a mound opening or in a main runway. Highly palatable pellets contain the active ingredient zinc phosphide, which produces phosphine gas inside the stomach to provide a quick kill. TropiClean Fresh Breath Drops is a tasteless and odorless water additive provides noticeably fresher breath for up to 12 hours. You'll see dramatic results in your pet's breath after just one week of use. Just three pumps a day keeps bad breath away! Veterinarian recommended for both cats and dogs. Offering easy installation, the Springer clamp can be attached to the frame or the seat stem of the bike. The Springer arm is secured to the clamp with a pull pin. The device has a heavy-duty steel spring, situated low on the arm to absorb up to 90% of the force of a dog's unexpected tugs. And that allows bike riders to keep their balance, while protecting their dogs from traffic, pedals, and wheels. ClotIt Powder ClotIt is a hemostatic product developed to stop bleeding FAST in all types of animals, including small animals, birds and reptiles. It's a patented compound of two all-natural minerals designed to enhance and animals own blood clotting process naturally, and to quickly stop bleeding in minor to severe wounds.